Begin by preparing the blueberry filling as it will need time to cool. In a small saucepan, whisk together the tapioca flour, lime juice, and sugar and then add the blueberries. Simmer on medium heat for 5 to 10 minutes, stirring regularly so the tapioca flour doesn't clump as t thickens. Once the sauce is thick and has turned translucent, remove from heat and cool completely. If you wish, add the gin and stir well. In a large mixing bowl, beat the butter and sugar together until smooth and fluffy. Add the eggs, one at a time, beating after each. In a medium bowl, whisk together the flour, baking power, baking soda, and salt. In a small bowl, whisk together the yoghurt, lime juice, and lime zest. Add one-third of the dry ingredients to the butter and sugar mixture, fold in gently until combined. Follow with one-third of the yoghurt mixture and gently fold, being careful not to overmix. Continue adding the dry ingredients and yoghurt mixture into the batter this way, in amounts of one-third at a time, mixing gently until the batter is homogeneous. Divide the batter evenly into 2 buttered and floured 7 to 8 inch round cake pans. Bake at 350F for about 45 minutes or until a tester comes out clean. Allow the cake to cool in the pan for 10 minutes, then invert the cakes onto wire racks and cool completely. To prepare the cream cheese frosting, whip the cream cheese and sugar together until smooth and silky. Gradually add the cream in 2 additions, whipping until the frosting has a very thick, spreadable consistency. Purée 1/3 cup of blueberry filling with a hand blender or in the food processor, and add it to the frosting mixture, beating well. If you want a darker color, you can add one more tablespoonful, but don't add too much or your frosting won't be thick enough to spread well. 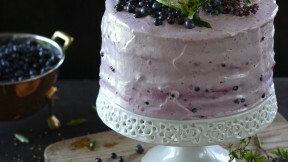 To assemble the cake: Once the cakes and blueberry filling are completely cooled, slice each cake carefully into two equal layers, using a sharp, serrated bread knife. Spread about 1/2 cup of cream cheese frosting on top of the first layer. Then add one third of your blueberry sauce on top of the frosting and spread it out evenly. Repeat until you reach the final cake layer. Now you can cover your entire cake with the rest of your frosting. Top with fresh blueberries, lime slices, and some purple edible flowers from your garden, such as lavender or oregano flowers.